Holmes and Watson only have 5760 minutes to solve a murder or the Queen will be next. 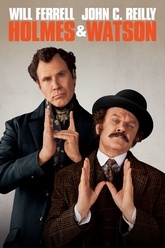 The Step Brothers are reunited—this time playing the world’s greatest detective and his loyal sidekick and biographer—as Will Ferrell and John C. Reilly star as Holmes & Watson. Together they join forces to solve a murder at Buckingham Palace. They soon realize that they only have 5760 minutes to solve the case, or the Queen will be next.